Existing mediation technology prioritises ad networks based on a static waterfall, using aggregated data. Campaign level data is not provided by SDK based demand partners, so the highest paying ad does not always win. For example, a network may have a predicted eCPM pay out of $20, which could be accurate on average, but in reality, this price consists of many campaigns varying significantly in value. Ultimately, there is no way to differentiate a $100 campaign from a $1 campaign. Without real time data, demand sources are organised in a static waterfall, which each line item being called sequentially in order of highest paying, until an ad request is fulfilled. SDK Bidding enables publishers to access real-time bid data from premium ad networks, reducing the need for a static waterfall and the reliance on historical performance data. 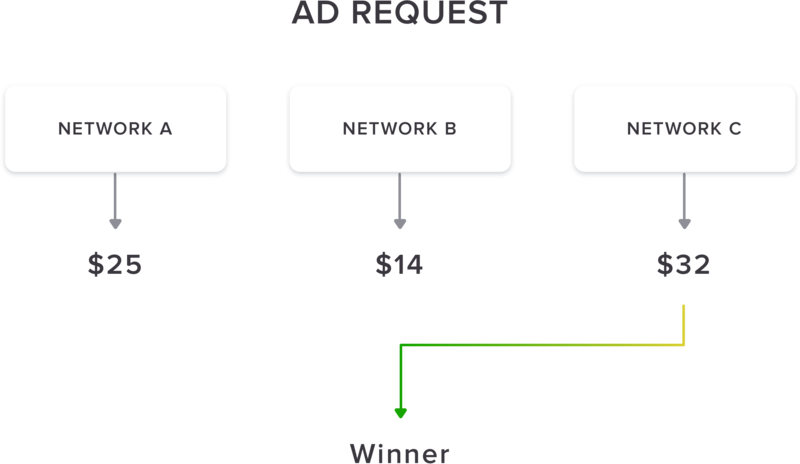 Networks are able to bid simultaneously in an unbiased auction, increasing yield for publishers and transparency for advertisers. With support for both Tapjoy and Vungle, SDK Bidding can be enabled/disabled any time from the network settings page. Tapdaq only applies SDK Bidding to a network's default zone. As such, you are able to run a real time auction and fixed price zones alongside one another.